The simple act of walking through a vineyard and taking a close look at what is happening inside and on the canopy will give you an idea of how your Vineyard IPM Program is working. If it has been a while since you said "What the heck is that? ", or words to that effect, you have probably not been in your vineyards often enough or looking closely enough. On the one hand, very few of us have the time to spend on a daily basis to get out into the vineyard and walk every row closely examining each vine in an attempt to catch a problem before it gets ahead of us. However, finding problems before they can be seen from the tractor seat may prevent economic crop loss or more expensive management options. The question becomes how to strike a balance between the time needed to scout and the benefits received from the scouting. One of the problems with developing a Vineyard IPM Scouting strategy is that there are so many factors that need to be taken into consideration that it is often difficult to know where to start. One way to approach the development of a scouting program is to look at it as developing a news story. Anyone who took a Journalism or English course in high school was subjected to the five W's and How of story development. Start looking at putting together the components of the pest management equivalent of Who, What, When, Where, Why and How and you will have a scouting plan in place before you know it. Following is a bit more detail on how you can go about developing your scouting program 'story'. Scouting for insect pests in vineyards is an essential component to a disease management system. Who? During vineyard establishment (Years 1 - 3) the key pest problems will be diseases and weeds. One of the keys components of scouting is having a thorough knowledge of the primary and secondary pests prior to planting the vineyard. Pests can be insects, diseases, weeds, viruses, birds, and mammals. Potential pest problems will vary depending on a number of factors such as variety, site, environmental conditions and length of time the vineyard has been in production. It is not within the scope of this article to list all of the primary and secondary pests that might be found in a vineyard as any insect, disease, weed, virus, bird, or mammal that impacts the growth or damages the fruit is considered a pest. There are many reference guides that should be in any vineyard operations library, or pickup and include pocket guides, facts sheets, and production guides such as those listed below. What? Correct identification of a pest is another key component in an effective scouting program. Knowing what you are looking for will allow your scouting trips to be more efficient and effective. Many times you will not be able to spot the pest, but only a symptom or damage that indicates the pest is present or has been present in the vineyard. When? The 'when's scouting can be easily answered by knowing a pest's biology and life cycle. Fact sheets typically provide this type of detailed information and are typically available on line at Universities, such as Cornell, Penn State, Michigan State and Ohio State. Also important is knowing about and keeping track of the environmental conditions that promote the development of the pest. Weather equipment is critical in tracking infection periods of grape diseases and growing degree-day accumulations useful in tracking insect and crop development. More information on weather equipment suitable for vineyard operations can be found here. Where? Developing a history of pest problems for each vineyard block is the best indicator of where to start your scouting efforts. This type of record keeping should start the year vines are put in the ground. Initially, to help ensure that you are catching a pest problem at its early stage, scout the entire vineyard each time you scout to determine where the pest hot spots are and what areas should be considered indicators for risk of pending pest problems. You may be able to tag vines in an area of the vineyard which will serve as indicators of all your pest problems but it will be more likely that you will have a number of areas where the first site of different pests will occur. These sites can easily be located on a good vineyard map and used in highlighting the areas where scouting should be concentrated at different times of the growing season for different pests. Why? Economics. Plain and simple, it costs too much not to scout. Not knowing what is going on in your vineyard can quickly result in crop loss that far outweighs the cost of scouting and any management tools you use to keep the pest under control. Not scouting often enough can lead to outbreaks that are often times impossible to control or if control is possible, the cost is significantly higher than it would have been if control measures had been used in a timely fashion. Resistance management is another benefit of scouting and is becoming more of a concern in all aspects of pesticide use from fungicides and insecticide to herbicides. The higher the pest population when a pesticide is applied, the better the chance of having a greater number of individuals in that population that are less susceptible to the pesticide applied. Continually applying pesticides with the same mode of action, or in the same chemical class, to high pest population levels can result in a selection for the pests showing resistance. How? The key to 'How' is to get out into the vineyard. Scout in a W pattern or series of Z patterns across the vineyard block to adequately sample for problems. If you identify problem 'hot spots' then always include these areas in each scouting trip. Consider using GBM pheromone traps in your scouting program starting in year three to assist in determining a vineyard block's risk of damage from grape berry moth. Weekly examination of traps also ensures that you are out in the vineyard scouting regularly, for all pests, throughout the season. If you put all these components of Vineyard IPM program together you will soon have the information you need to develop a pest database and pest calendar of events for each of your vineyard blocks. 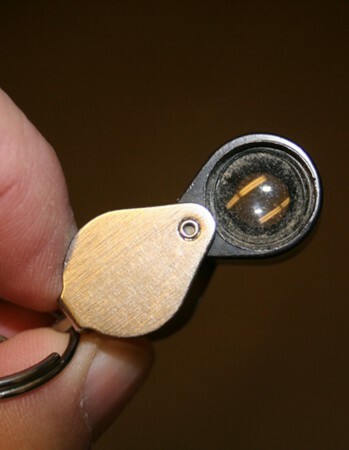 A magnifying lens, such as this hand lens, will make scouting and identifying insects and diseases much easier for vineyard managers. Clipboard - handy to keep all the scouting forms and vineyard maps in one place. You can set them down without having to worry about them blowing around. You can also tie your pencil onto the ring of the clipboard so you are in less danger of losing it. Vineyard maps - a must have. Provides a place to jot notes, identify location of pest problems and record observations not related to pests in one place. 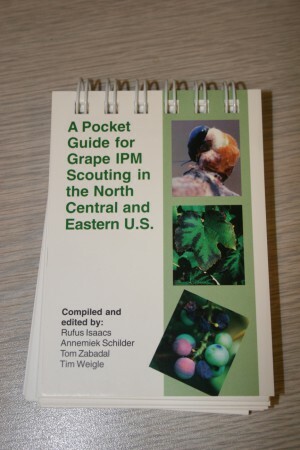 Scouting worksheets - some general worksheets for insects, diseases and weeds and specific worksheets for grape berry moth and grape leafhopper. Hand lens - one of the most important tools you can have as it will allow you to get to a level necessary to help correctly identify a pest, especially diseases. Pocket knife - great for cutting open shoots, scraping at trunks and skinning berries to see what is inside. Pencils - the more the merrier. Even if you tie a pencil onto your clipboard you should figure on breaking at least one while you are out, so carry a spare. Flagging tape - designate problem areas on your maps and mark them with flagging tape to help you find your way back. The map will get you close, but the flagging tape is easily seen and gets you back to the problem site without too much searching. Vials - whether you purchase them commercially or use old prescription bottles, the main objective is to have something you can restrain things in whether it is an insect you need identified or grapes that have a malady to be looked at. If it is solid and has a tight fitting lid the only other requirement is ease of carrying. Make sure it is large enough to fit some of the insects you want to capture but not so large that carrying a number of them will be cumbersome. Plastic zip-lock bags - with moist paper toweling these provide a great place to keep leaf samples in prime condition if you need to get them back to the shop for further examination and identification of pests. Camera - digital cameras are rapidly becoming an inexpensive tool that you can add to your scouting kit. This allows you to send a photo to others to help you with identification of a problem. Make sure you chose a camera that allows you to get close-ups (some have add on macro lenses that really get you in close) to get the detail needed for proper identification of some pests.